How Much Will My Laser Treatment for Rosacea Cost? We understand that cost is important for you when deciding on how to treat your Rosacea. There are lots of treatments out there to help keep it in check. Topical creams, gels and washes and oral medications are commonly used, and some may even be covered by your medical insurance. Clearly, using something like this at home may be the cheaper and more convenient option. But, what if they’re not working? Or what if they help, but you’d like more redness reduction? Then laser treatment of Rosacea may be worth looking into for you. There’s really no comparison of medications for Rosacea and laser treatment; none of them can do what the laser can. They are apples and oranges. So if you’re ready to have laser treatment, understand that there are a few different options that can be used. IPL (Intense Pulsed Light) and pulsed-dye lasers are the two most commonly used devices out there. At Celibre, we use only pulsed-dye lasers like the Candela V-beam and Cynosure V-star to reduce the facial redness of Rosacea. In the Los Angeles area, we’ve found that the price for laser treatment of Rosacea ranges from $250-$500. Why the large range? Several things factor into the cost. The experience of the laser practitioner, the severity of your rosacea and the time needed to treat you may all be factors. Sometimes, an RN, NP or PA may charge less than a physician, simply because all of these practitioners have different values for their time spent in treatment. Regardless of the credentials, you want to make sure that whomever treats you is highly trained and has lots of experience with laser treatment of Rosacea. Some practices will also use a protocol known as “bruising” to treat Rosacea with lasers. These treatments usually take more time, so they may cost a bit more. Make sure you feel comfortable with your practitioner and know what kind of laser treatment you’re getting and why. We would love the opportunity to help you manage your Rosacea with one of our state-of-the-art lasers. A consultation is absolutely free to you. We make your education our priority and will walk you through our laser treatment of Rosacea step-by-step. We’ve helped lots of people with Rosacea — check out our before and after picture gallery. We can help you too. Please give us a call today! 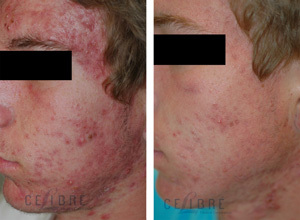 Contact Celibre today for your rosacea laser treatment!